Between 440-510 million years ago (the Paleozoic period) a warm tropical sea flooded the region, which was then near the equator. The beds of limestone that you see along the riverbank today were deposited at this time, in large part due to the life processes of organisms. Algae and bacteria were responsible for the growth of stromatolites, and the elaborate shells of lime-precipating animals such as orthocones can be seen in several places along both shores of the river today. Their principal locations and characteristics are described below. 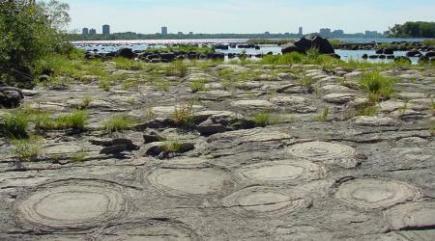 Stromatolites in the Ottawa River are present just downriver from Westboro Beach, but the section of river near the Champlain Bridge has one of the best known displays of fossil stromatolites in the country – and certainly in any urban area. At low water periods at the end of dry summers and early fall large slabs of sedimentary rock appear along the river to expose the stromatolites and other ancient creatures. Stromatolites are biofilm layers built up by cyanobacteria. These layers encompass the most primitive life forms and are generally regarded as falling somewhere between the plant and animal kingdoms (bacteria, blue-green algae, etc.). They are regarded as biogenic structures as they are not true body fossils. Like orthocones, stromatoporoids, brachiopods, corals, etc., they thrive in warm aquatic environments and build reefs. Cyanobacteria and algae were likely responsible for the creation of the oxygen in the Earth’s atmosphere. They were the dominant lifeform on earth for over 2 billion years. Today they live in abundance in only a few localities worldwide. One of these places is Australia where a very salty protected environment has enabled them to live in an intertidal zone. These stromatolite remnants are over 450 million years old. The larger domes are arrayed in parallel north-south lines which, by analogy with Hamelin Pool, represents control of their growth by tides. The smaller stromatolites show a distinct east-west elongation, and this together with associated ripple marks, suggests the flow of longshore currents in a shallow-water warm saline environment. More stromatolites are visible in the transitway walls from the pedestrian bridge at the end of Roosevelt Avenue in Westboro. It’s interesting that this prized collection of stromatolites in the Ottawa goes virtually unnoticed while a site one tenth the size in New York State is the basis for a state park. It’s worth noting that these stromatolites form very hard sedimentary rock which requires excessive force to break through – just ask anyone who tries to dig their basement or install a sewer or water main in the Westboro Beach area of Ottawa. There are several other stromatolite sites along the river, although less spectacular than those at the Champlain Bridge site. Exposures exist on the Ottawa River near the bridge south of Pembroke, and on the shore just east of Port O’Call Marina near Dunrobin. Small outcrops of stromatolites also occur in a few other places in eastern Ontario. All are different, but the Fitzroy stromatolites, although less spectacular than those at the Champlain Bridge site, are certainly more impressive than the others. Just down river from Mousette Park (about 1 km down river from Champlain Bridge) is another large rock shelf that sometimes becomes exposed in late summer. On it are a number of interesting fossils from the same geologic time period as the stromatolites by Champlain Bridge (the Pamelia formation, of the Ottawa Group in the late Ordovician period, 450 million years ago). Perhaps the most interesting are the numerous orthocones – the early ancestor to today’s octopus. Orthocones are now extinct, but might have looked like the long cones in the following sketches. What orthocones are believed to have looked like. 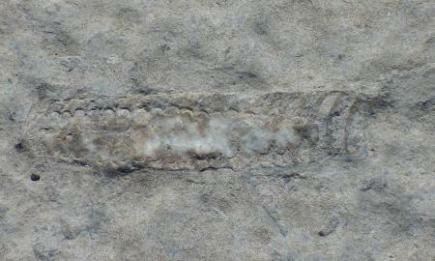 Associated with the numerous orthocones are evidence of sedimentary feeding worms. As only their burrows are visible, they are referred to as trace fossils – we know they were there to make the burrows, but no hard (skeletal) parts are preserved. Their aquatic environment is evidenced by the ripples in the limestone. For more information on the Ottawa River site contact Allan Donaldson at the Ottawa-Carleton Geoscience Centre, or Ross Knight at Natural Resources Canada.